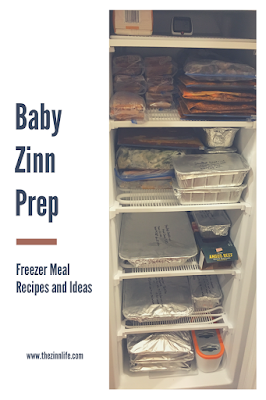 The Zinn Life: Baby Zinn Prep: Freezer Meal Recipes and Ideas! Baby Zinn Prep: Freezer Meal Recipes and Ideas! 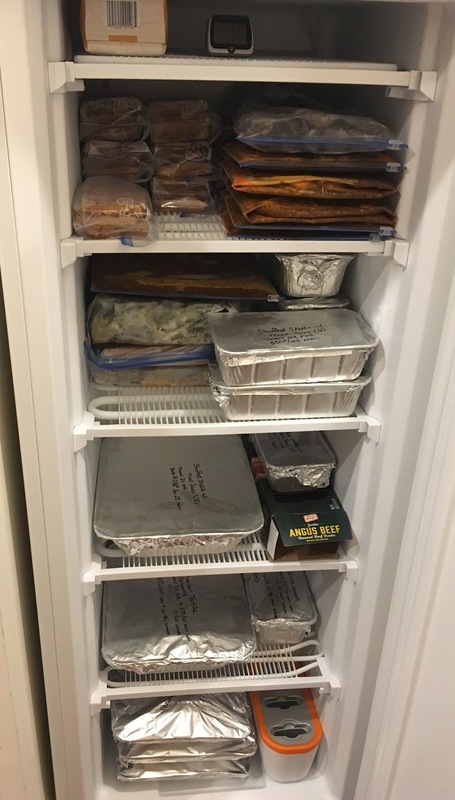 Welcome to part two of my freezer meal posts!As I mentioned in last week's post, I've been working on this gigantic project of making a ton of freezer meals so I don't have to cook for the first few months of my son's life. In that post, I talked about my planning and supplies. Today, I'm going to provide you with the recipes I used and my plans for them! 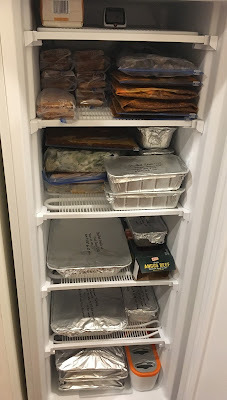 First, let's talk about the types of freezer food I did. Casseroles - I have some casseroles in 9x13 pans and I have smaller versions of the casseroles in loaf pans. The 9x13 pans will feed us for multiple days and the loaf pans will feed us one dinner and one lunch. This way we don't get tired of eating the same things over and over! Individual Packs - I packaged some items (like freezer waffles) in individual packs. This is more for my husband than anything. He's not always the best at portion control. So, I used my 2 quart ziplocs to make individual packs for breakfast to ensure that a) I made enough and b) he didn't eat all of them at once! 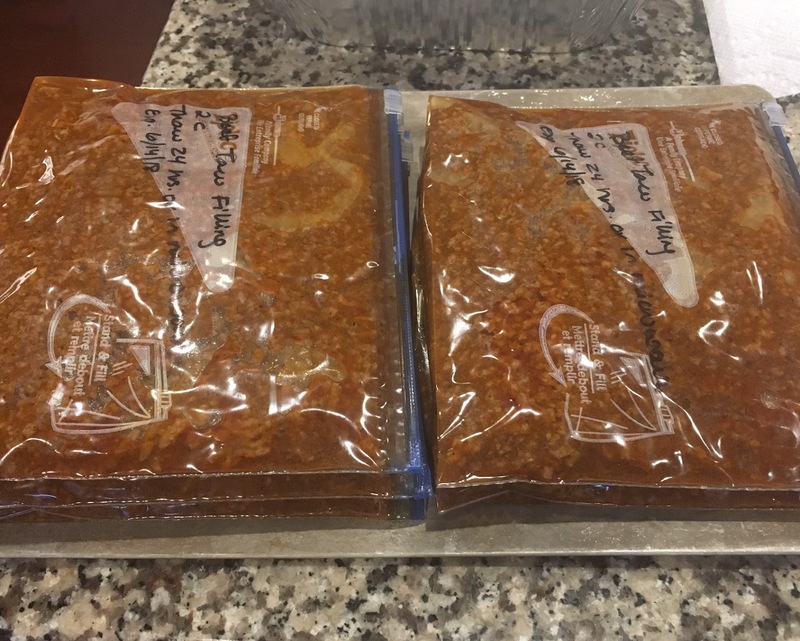 Meat Packs - I got this idea from the Pioneer Woman. She's a genius, I tell ya! In her cookbook, "Dinnertime," she lists a bunch of recipes for meats and fillings that you can then use for multiple recipes. These include beef taco meat, meatballs, chili packets, taco chicken filling, etc. Crock Pot Freezer Meals - While the crock pot is amazing on its own (no, I don't have an Instant Pot), there are times when you literally just want to dump some meals and go. So I made a few crock pot freezer meals that you literally just thaw and dump in the crock pot. Fillers - At some point along the way, I realized this was a ridiculous amount of work and that I probably wouldn't get to three months of food that I made. So, I started working on back-ups that I could buy that would still be food we wanted to eat and didn't require a lot of work on my part. Let's get to the real part of this post, shall we? The part you actually care about! The recipes! I'll share what I've made, how I've packaged each and some of what's still in the plan to be made. I found this oh so amazing and easy recipe in one of my favorite cookbooks from our Paleo days - Against All Grain's Meals Made Simple. I also loved it because it helped clean out some of my frou frou flours that I hardly ever use anymore. I made these waffles in my Cuisinart Griddler and Waffle maker. While the recipe says you'll get 24 waffles, I got about 12 per recipe, maybe a little more. I packed these 3 to a pack and have 9 packs. They are super fluffy and really, really good. You honestly can't even tell they're gluten free! I also plan to make some breakfast burritos and egg muffin frittatas for us. But, who knows if that's going to happen! I plan to package all of the breakfast items individually, though, so it's just a grab and go kind of thing. I didn't find a recipe to link to for this one, but any type of taco meat would work. Simply use ground beef and then season with either tomato sauce, chili powder, cayenne and cumin or use a premade chili pack. 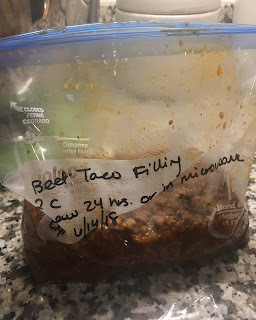 I froze two cups of the taco meat per 2 quart freezer bag for a total of 6 bags. I used 6 pounds of ground beef. To store the taco meat, I pre-labeled all of my two quart bags with the contents, how much and reheating instructions. Once the meat was prepared, I poured two cups into each bag. I use the stand and fill bags, which makes it easier to load! Once filled, I then flattened them for easier storage. This is an art, you have to let some air out while flattening to get the extra air bubbles out. Finally, I stacked them on my small cookie sheet and loaded into the freezer to freeze. This method works great for any type of soup, stew, or meat mixture. This is not a recipe, but something totally worth having on hand. When I buy chicken, I tend to either buy it at BJs or at Harris Teeter, both in large quantities. 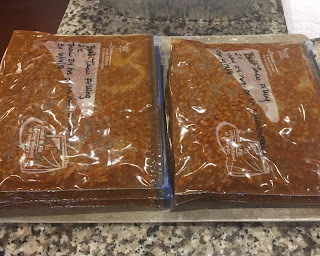 I go home and split some chicken breasts into two and package into one pound packs (see below) or I'll cube the chicken and put into one pound packs. This comes in handy for quick back up meals like Marion's Kitchen meal kits or even pan grilling some chicken and throwing it in with. But having it already cubed, you save yourself a good amount of time! I use my two quart freezer bags for this. I always like to have some boneless skinless chicken breasts that aren't cubed. These are great for seasoning and making with vegetables or even putting in the crockpot. You don't always want (or need) cubed chicken, but having portioned out in 3-4 oz. breasts also cuts down on prep time. I use the two quart freezer bags for this as well. Casseroles are one of the easiest things to freeze. I love to have them on hand, but also get tired of eating the same thing over and over, so I solve that by having larger casseroles and some smaller ones in loaf pans. Thankfully, the freezer 9x13 pans are just a tiny bit smaller than your regular 9x13 casserole dish, so I always have some leftover to make a small loaf pan without having to do any extra work! When I make the casseroles, I use disposable pans and I write the directions on the tin foil. This way, I don't have to look them up in a book and someone else can easily pop the food in the oven without my help. The less work I have to do, the better! Here are some of my favorite casseroles that I've already made! I was able to make a 9x13 casserole and a loaf pan with this recipe! The covers us for a couple meals one week and then lunch and dinner another. This is one of my very favorite freezer meals to make! I'm not a big fan of the regular stuff shells recipe because I like meat in my meals and that one just has cheese stuffed shells. This one, though, has the perfect amount of meat and cheese. I usually make two batches of these. One big casserole and then five small loaf pans. I estimate about 3 shells per person and a loaf pan holds six, so a loaf pan will either cover us for dinner or dinner and a lunch for someone, depending on how hungry we are. I promise, I made more than just recipes from PW! But her stuff is so good! Lasagna roll-ups is my new favorite way to do lasagna. Aaron has a small problem with portion control (he has none), so roll-ups are great. One normally does it for me while he definitely eats two. But it helps keep him from eating so much at once! I made two of these as well, doing a full 9x13 dish and opted to do the second set in loaf pans instead. 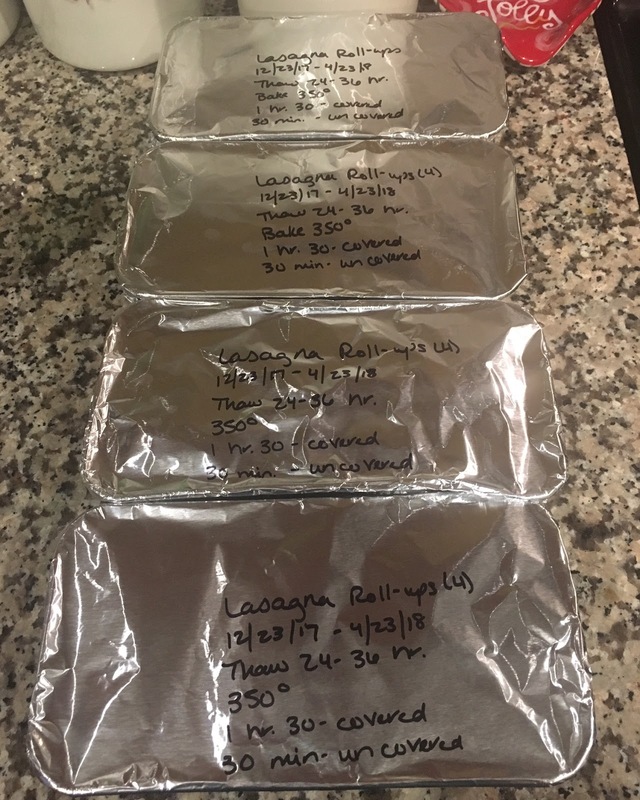 I was able to get four loaf pans with four roll-ups each. 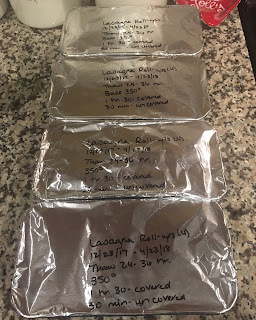 Lasagna Roll-ups packaged with instructions on top! Full confession, I can barely choke these down pregnant. The texture is not okay for this pregnant lady. However, the taste is wonderful and I'm excited to eat them again when my texture issues aren't off the charts (thanks Little Man!). I liked this recipe because it uses lots of veggies, which you don't always get when doing freezer meals. I made two batches of these, we ate one and then we froze one. The author recommends freezing these in a gallon size ziploc, so I did! They take up a lot less space than the 9x13 pans! For us, this fed us both dinner and lunch the next day. I froze these in gallon size ziploc bags, as suggested by the site. Marion's Kitchen meal kits - I did a post reviewing these meal kits a while back. I love that they are easy and have good ingredients that you actually know what they are. They're pretty cheap at Wal-mart, but I've also found them at Harris Teeter. These are great to use the cubed chicken breast with! PF Chang's Meals for two - Hi, I'm Sarah and I love Asian-inspired food! The PF Chang's frozen meals for two are actually really good and easy to do. We have a few of these in the freezer now. Stouffer's Chicken Enchiladas - This is by far my favorite frozen family meal. It's so good! I almost always have one of these in my freezer. Pasta - I have a variety of pastas on hand - macaroni and cheese, penne, spaghetti noodles, etc. These can be used with the meats up top to make lots of meals! Uncle Ben's 90 Second Rice packs - These things are a life saver in my world. I mostly use the Spanish, Jasmine and Basmati rice packs. They're great because they literally just take 90 seconds in a microwave and bam - you have a side dish. They pair perfectly with the PF Chang's Meals and the meal kits. To finish up my meals, I've actually signed up to do a Pampered Chef freezer meal prep party with one of my friends. You choose a menu and make 10 meals to take home and freeze. Hopefully, that will finish up my freezing because this lady is tired! I've also hit that point where I don't want to cook anymore (already!! ), but I'm trying to be good and not break into those meals just yet. Here's what my freezer looks like right now (minus the girl scout cookies that we just added last week). Have you done any freezer meals? What are some of your favorites?! Thank you! It's not hard, but it does take quite a bit of time! Organization is key! !